Improper care of caviar will change a delicious, expensive caviar into a cheap tasting mound of fish eggs. Caviar is a very perishable product and needs to be properly stored and served to retain its delicate flavors. Here are a few tips for keeping caviar at its best. Caviar is very perishable. An unopened can or jar will stay fresh for up to four weeks, but once opened will only last about three days. 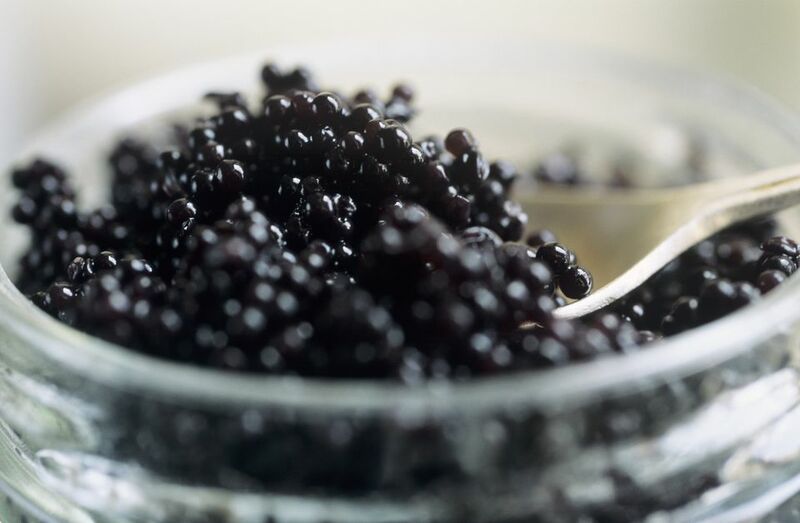 The ideal temperature for storing caviar is 28 to 30 degrees Fahrenheit. Most household refrigerators won't reach this temperature, so place the caviar in the coldest part, which is the very bottom drawer. Do not keep caviar in the freezer. This will destroy its delicate texture. After the jar or can has been opened, minimize the caviar's exposure to air by wrapping the container with plastic before storing in the fridge. Remove the caviar from the fridge and let stand at room temperature unopened for ten minutes before serving. Just before serving, remove the lid. The caviar may be transferred to small bowls or consumed directly from the container. Putting the container on crushed ice will help prolong the caviar's freshness. There are several decorative caviar presenters on the market specifically for this purpose. The idea that you shouldn't use metal spoons to eat caviar is a myth. Caviar is stored and sold in metal containers with no adverse effects. Presenting your guests with metal spoons, however, may have a psychological effect, which may cause them to judge the caviar as inferior before they have even tasted it. Traditional caviar spoons, available at most caviar retailers, are made from mother of pearl or bone. Caviar has a delicate flavor and should be served with accompaniments that don't overwhelm its flavor (if with anything at all). Remember simpler is better. Traditional garnishes include small slices of toast, blinis (small pancakes), unsalted crackers, creme fraiche or sour cream. Ice-cold vodka or champagne is the drink of choice. If you are serving caviar by itself, figure on 1 to 2 ounces per person. If the caviar will be served on top of something else as an hors d'oeuvre, use 1/2 to 1 ounce per person as a guide.